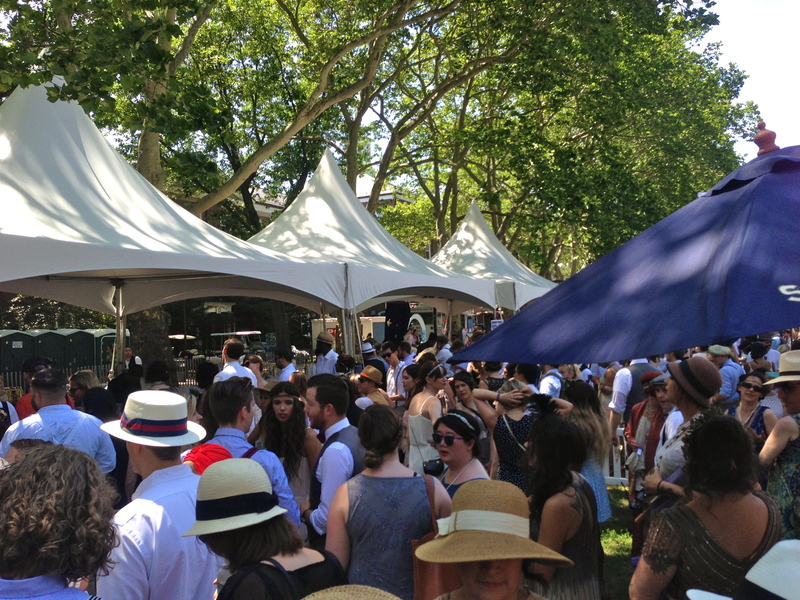 Full disclosure: I paid $85 to go to the Jazz Age Lawn Party this weekend, and it was not as cool as I expected. Actually, it was the epitome of everything I hate: lines, crowds, lies. New friends, in great misery due to waiting in line. “Redeem these at any of our food and beverage stations,” it said. “Ok, fantastic. Now we don’t have to pay for anything once we get into the party,” we said, with expectations high. Normally, the entrance fee is $55 with no meal or drink tickets, so we thought we hit the jackpot. NEVER HAVE I FELT LIKE SUCH A NOOB. When we arrived around noon, we were herded into a tiny pen on spacious Governor’s Island, and waited in a variety of lines for a total of 2.5 hours. We were brought to this party on false pretenses – one entree and side, right? $8 gets you nowhere. The food truck we went to was delicious, but a sandwich was $12-$14, and the owners of the truck had no intention of giving us a side, because they weren’t told they needed to provide it! We bartered and used our soda tickets instead of paying out-of-pocket. Why am I going to a modern day food truck? This party is supposed to be 1920s themed. I was a little disappointed that the party didn’t stick to the premise. 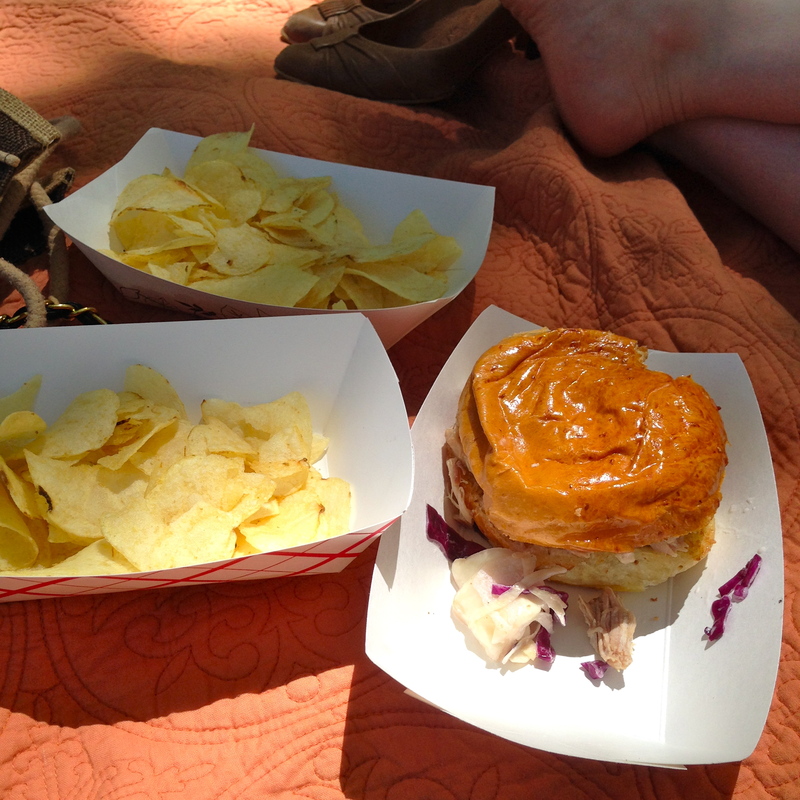 After we ordered, we squeezed our blanket in between other picnickers, and ate. Then we decided to get drinks. Terrible idea. We waited for over an hour for drinks, but we already paid for them when we bought our tickets, so it was about the principle of the thing! At that point, we decided to each use all four of our drink tickets at once – we bartered with the bartender and ended up getting a couple full sized bottles of champagne. The problem: One bartender for each of the four lines. He was hustling too! This party literally drove us to drink….which ultimately made the day go a lot better. 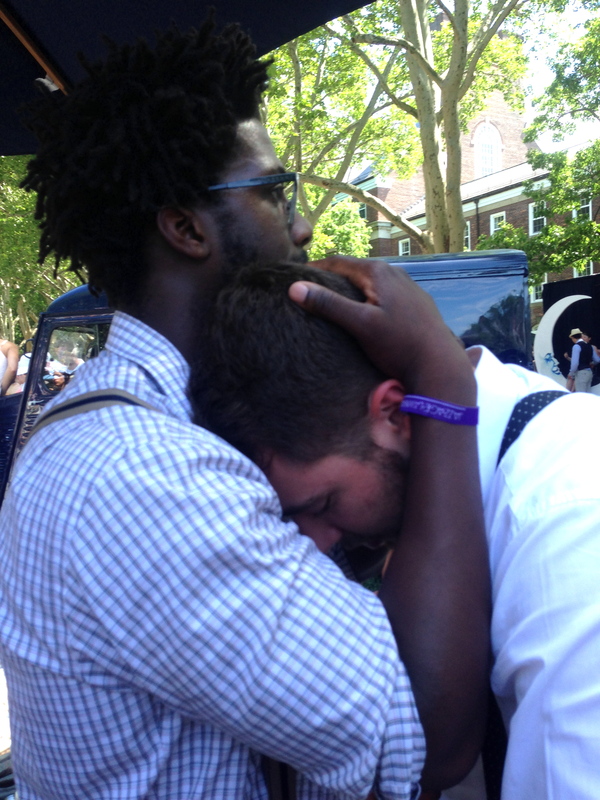 The Jazz Age Lawn Party continues in August, but I won’t be there. Not worth the money to get all dressed up, then treated like cattle. 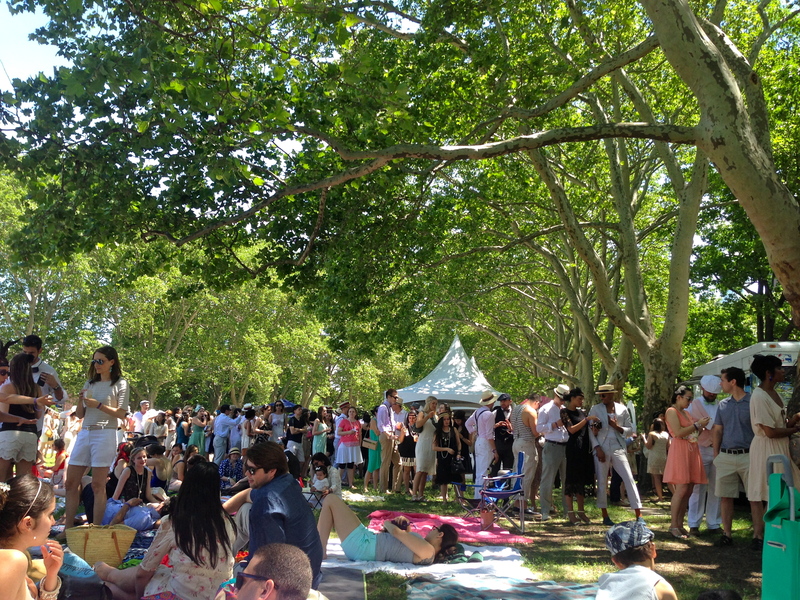 Bye, Jazz Age Lawn Party. 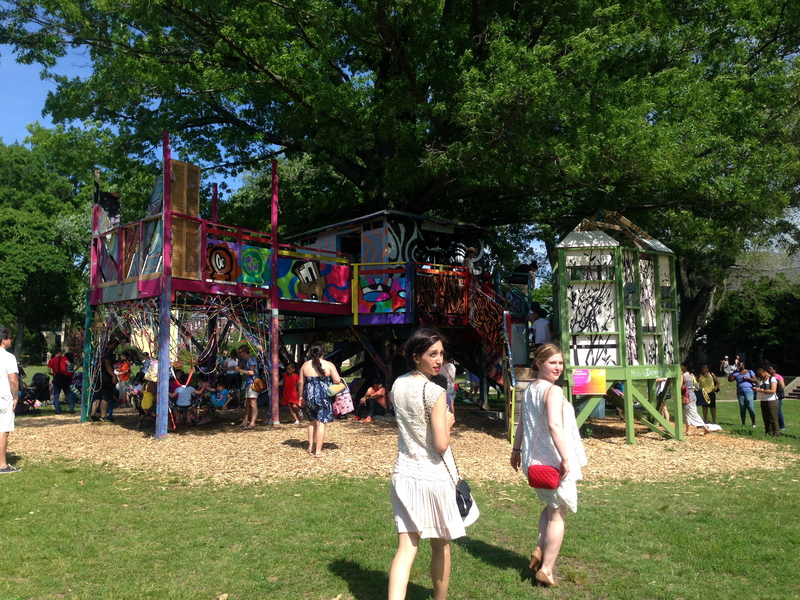 We left the party to walk around Governor’s Island, which was infinitely cooler. 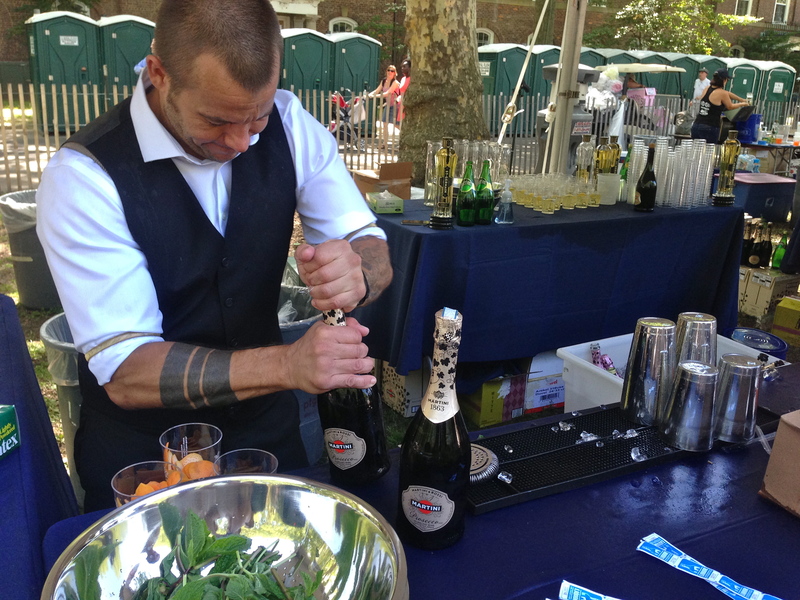 Strange as it may sound, I went to the Jazz Age Lawn Party last summer and had a blast! It was crowded, but we didn’t wait very long for anything…perhaps our first drink took 10-15 minutes. But we didn’t wait for food, and the lines thinned out as the day went on. Our tickets cost $35 and then we purchased everything separately. It’s interesting how people’s experiences can be so different. Perhaps the one in August is less crowded than the one in June? We did venture around the island a bit and it was lovely. I would go back, but it is a pricey day if you add in the drinks and food, but overall our group had a fab time. There’s something about an event being too crowded that can make a lot of people angry. Maybe it was because it was the very first one of the summer? Either way, maybe the event could be capped at a max amount of people so everyone would be able to have a great experience no matter which day they go to! This comment is more than a bit late, but thanks ever so much for this perspective. I’m thinking of attending the August event, but will drive three hours to get there. Not sure I fancy standing in lines whilst famishing, and then chowing down on food that looks to be little better than fast-food fare. I hope that the other attractions (live music, antique autos and phonographs) compensate for this somewhat? Hi Clate – To be honest, the other attractions did not make up for it for me. The champagne did. If you go, I recommend getting there early so you don’t have to wait to get in to the event, claim your spot with a picnic blanket, and get your food and drinks then. Otherwise, bring your own food and drinks so you don’t have to wait in any lines, and just get on the dance floor! My biggest problem here was that I pre-paid for things and had to stand in lines to wait for them, wasting precious time. My favorite part was leaving the crowded pen and discovering more of Governor’s Island. Know that I attended a Saturday event, which is why it could have been very packed. Sunday may be better. Let me know how it goes! bummer. I love this event, but I totally get where you are coming from. the line that makes me the craziest is the one to get into the event. it’s just brutal, and like you pointed out, paying $85 or even $55 is no joke, you’ve already waited just to get on the ferry…get more people at the door so that everyone can stroll in leisurely-like!! You should definitely consider contacting the JALP, I know another couple did and got big apologies and free tix for August. Personally, I purchased the meal package for August somewhat skeptically but fortunately didn’t have problems with lines. Thanks for the tip, Eden, I’ll write to them. I think the major issue here was that the expectations did not match the event.